Almost 1,000 lightweighting suggestions for the chassis, powertrain, transmission and drive-specific electronic parts of a hybrid passenger car as well as for a truck powertrain have been developed. That is the result of anunprecedented international initiative consisting of companies from the steel and forging industries. The collaborative ideas relate to lightweighting achieved through materials, design and manufacturing as well as to conceptual lightweight design. Sidenor has been involved in this initiative since 2017. Further reducing the weight of vehicles is one of the decisive challenges facing the automotive industry in the near future. This is because less weight results in lower CO2 emissions thanks to reduced fuel consumption, as well as in improved material and resource efficiency, the possibility of higher payloads, an enhanced driving experience, increased safety and, last but not least, a crucial contribution to the environment. Thanks to its lightweight design qualities, modern steels will retain a central role in these developments. Since 2013, The Lightweight Forging Initiative, a cooperation of companies from the steel and forging industries, has been revealing the previously unknown lightweighting potential offered by forged steel parts in the powertrain and chassis. Lightweight Forging: 1,000 Lightweighting Ideas and 217 kg of Lightweighting Potential from Sidenor Aceros Especiales on Vimeo. Phase III, which has now been completed, consisted of 39 cooperation partners from Western Europe, Sidenor between them, the US and Japan. This third phase began in July 2017 with the disassembly and documentation of a hybrid split-axle four-wheel drive SUV. This work was carried out by the automotive research company fka Forschungsgesellschaft Kraftfahrwesen mbH, located in Aachen, Germany. Likewise, the transmission, drive shaft and rear axle of a heavy-duty commercial vehicle were disassembled. During a workshop at the end of January 2018 at the fka in Aachen, 80 experts from the companies involved in the project then had the opportunity to assess over 4,000 parts themselves and inspect them with regard to potential lightweighting measures. 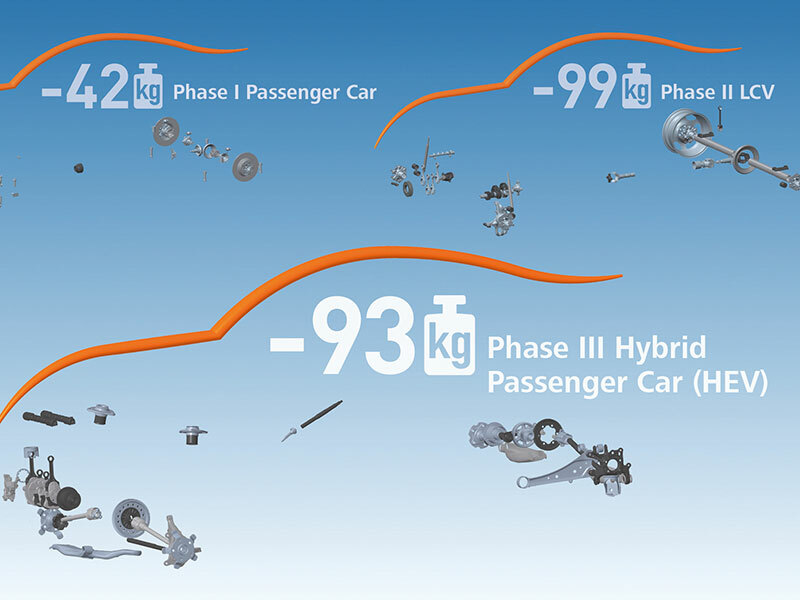 The above-named systems in the hybrid passenger car have a reference mass of 816 kg. 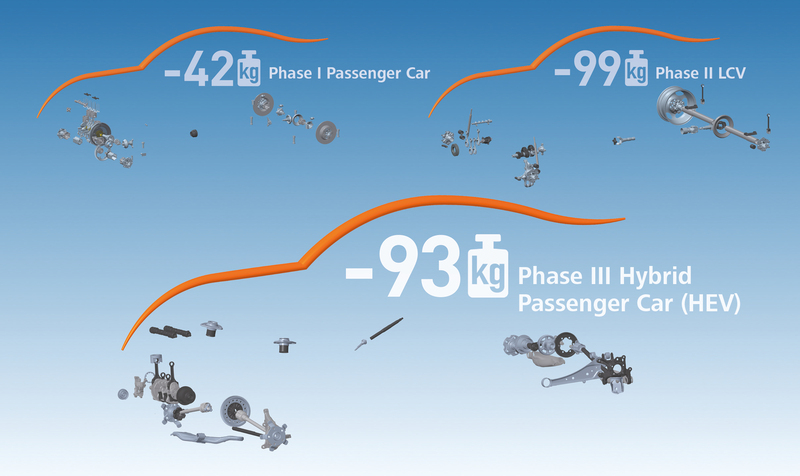 The lightweighting approaches developed during Phase III add up to a weight reduction of 93 kg in total for this vehicle. For the truck powertrain, with a reference mass of 909 kg, the experts were able to promise a total weight reduction of 124 kg in the transmission, drive shaft and rear axle. Now the suppliers involved, Sidenor between them, are faced with the task of communicating their proposed solutions to existing and potential customers and underlining the benefits of these solutions to developers, designers and buyers. “The Initiative would like to promote communication about lightweighting along the entire supply chain, from steel manufacture, forging and component manufacture through to automotive application, and to ensure that new lightweighting solutions based on forging find implementation,” explains Dr. Hans-Willi Raedt, Chairman of The Lightweight Forging Initiative for the forging partners.